I love Christmas. It's by far my favorite time of year...the chill in the air, white lights everywhere, holiday music and an overall feeling of goodness, kindness and giving....I mean, what's not to love? And I have so many wonderful memories of Christmas growing up, complete with lots of family traditions (my mama was so good about making traditions and memories). Things like decorating the tree with lots of special ornaments, baking and decorating a homemade gingerbread house every year, opening one gift every Christmas Eve and reading the first Christmas story from the Bible before opening gifts each Christmas morning. And of course, there was the Advent Calendar.... I'm pretty sure there wasn't a year that passed that we didn't have one....and every year my brother and I looked forward to opening the little windows to see what was inside (and probably fought over it a little bit too!). And now that I have kids of my own, Advent Calendars have become somewhat of a tradition in our house as well. Some years it's one filled with candy, some with Lego figures, all with little surprises that each bring us one day closer to Christmas. But Advent Calendars aren't just for kids anymore (insert cheers!) 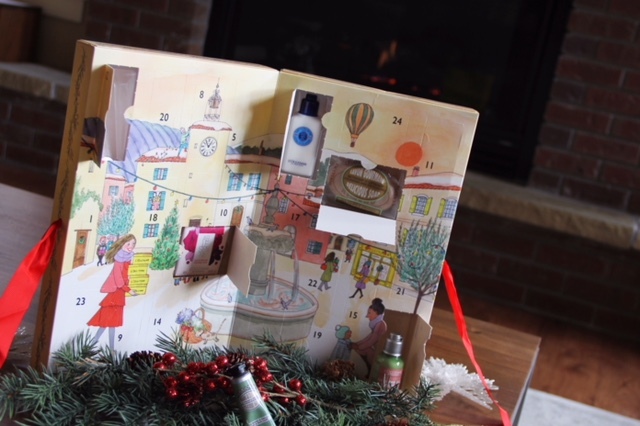 because L'Occitane has a couple of amazing new Advent Calendars that make the perfect gift for the grown-up beauty-lover in your life (think mom, sister, aunt, friend....I know my niece would absolutely love one!) And you guys, these calendars are gorgeous! Plus not only are they so pretty to look at, they are also each filled with 24 sample size L'Occitane products....everything from bath gel to shower oil, soap to hand cream, shampoo and conditioner to body lotion....a little of everything! And the scents are amazing.... almond, shea butter, peony, cherry blossom and verbena products....and believe me, they all smell incredible. And the best part, besides having so many luxe, high-quality product options to try all in one place, is that there are actually two calendar options as well, so you can choose the perfect gift for whoever is on your shopping list. - Aromachologie Relaxing Shower Gel 1.18 fl.oz. - Cherry Blossom Shower Gel 1.18 fl. oz. - Cherry Blossom Shimmering Lotion 1.18 fl. oz. - Citrus Verbena Shower Gel 1 fl.oz. - Aromachologie Revitalizing Sugar Cube 1.4 oz. - Peony Flora Hand Cream 0.33 oz. So now that I've shared a little overview, let me just tell you about a few of my very favorite products from these sets (it was so much fun trying all of them)! There are a number of products that come in both boxes so let me start with my favorites of those.....namely L'Occitane's Almond Delicious Hand Cream, Aromachologie Relaxing Shower Gel and Arlesienne Eau de Toilette. The Almond Delicious Hand Cream just has a very appealing light almond scent, a creamy (but not greasy) feel and isn't at all overpowering but moisturizes really well. My next fave, the Aromachologie Relaxing Shower Gel, has a somewhat earthy, woodsy scent to me and a nice gel texture. I actually think it would work well for a man or a woman (as it's not super feminine or floral) so might make a great gift or stocking-stuffer for the man in your life. And finally, probably my very fave product was the lovely floral and very feminine Arlesienne Eau de Toilette. I love the scent of this product! But again while it does have a very beautiful floral scent, it's a light perfume that is subtle rather than overpowering, which is the best kind if you ask me. And don't worry, I've linked all these products so you can check them out and try them for yourself. As far as other products I really enjoyed, the Peony Flora Hand Cream, Verbena Body Lotion and Shea Butter Lip Balm topped my list from the Signature Calendar. I am a sucker for pretty, girly scents and both the Peony Cream and Verbena Lotion fit the bill there. Light, fresh and creamy in texture, I can see myself using both a lot. And I literally do not leave the house without lip balm and L'Occitane's Shea Butter Balm is virtually scent-free, goes on smoothly (isn't sticky) and feels really moisturizing.... so I think I've found my new lip balm go-to. So if you're starting to Christmas shop or need a unique and gorgeous gift idea for that hard-to-shop-for person (or really anyone who loves skincare, bath or beauty products), I would highly recommend checking out both L'Occitane's Signature and Luxury Advent Calendars. I'm pretty sure you'll be as impressed by them as I was. And let me know what you think! Here's to getting a jump on the holiday shopping and getting into the Christmas giving spirit! *This post was sponsored by L'Occitane USA but all opinions are 100% honest and mine alone.